We don’t know very well how we have done it, but today it’s the fifth anniversary of Yeeply and it seems that we will continue going strong. The truth is that we are very happy to have gotten here and we want to thank you individually for those who have believed in us. Maybe when you read this message you do not remember who we are, it is possible, but surely at some point you had an idea to develop an app or web, and you used our services! To those who put their ideas, projects and even their companies in our hands. Thank you for your trust and support. 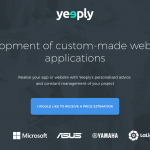 To the professionals who are always working very hard for Yeeply to give the best service possible. Therefore, thanks to the arguments that are sometimes needed to complete projects and being flexible to make the impossible, possible. To all the people that are part of the Yeeply family, who make it possible to keep growing as a team and a company. Thank you for the dedication, passion and excitement that you are putting in your work. To the organizations and institutions that have allowed us to grow in one way or another: StartUPV, ENISA, IVACE, UE, PlugandPlay. Thanks for believing in us! To those who have invested their time and money to help us grow. Thanks to our investors, advisors, other entrepreneurs and many others. A special thanks to our families, friends and closest people around us for all their support during this journey. And last but not least, thanks to the people who made it hard for us to get at the point we are now. Thanks for challenging us and preventing us from sitting back and relax. To keep us motivated and learn the utmost by taking risks. Do you have an idea on how much developing a mobile app will cost? New website: it’s time for a change!